Leros, is situated in the northern group of Dodecanese slands. The capital is in Aghia Marina, the old port. Leros, known as the island of Artemis, was present in all historical periods. Homer mentions that Leros with its fleet, took part in the Trojan War. Leros has many natural attractions, picturesque coasts and beaches, considerable green, traditional houses, historical and archaeological monuments and above all, the hospitality of its people. The island's most beautiful bays are Goumas and Poito Lago, set so deep inland it seems to cut the island in two. The capital is built amphi-theatrically on a hillside and is crowned by a Franco-Byzantine fortress. Like Kalymnos, Leros is essentially the home of sponge fisherman. The ancient settlement of Leros, according to available indications, was in the area of Aghia Marina.The Temple of Artemis, in Partheni. The castle with the Holly Mother Chapel, on top of the hill overlooking Aghia Marina, Platanos, and Panteli it was considered as of Byzantine origin but more recent indications place it earlier than that. it is well preserved and dominates the whole of Leros. Bellow that castle in the port of Aghia Marina are the ruins of the Bruzi Fort. In the area of Xirocambos is the castle of Lepida, known as "Paliokastro". Its eastern side is built with carved rocks,"Cyclopean". The archaelogical museum of Leros is housed in the neoclassic building of the municipal schools, while the historical and cultural museum of Leros, is to be found in the Belleni Tower in Alinda. Furthermore, the Ecclesiastic (church) Treasuries, exhibited in Panagia of the Castle, include Byzantine icons and other sucred ornaments and objects. The local traditions of the island, are revived to this day, as well as the traditional songs of Leros, that can still be heard in weddings, baptisms and other manifestations. Ormos Lakki – Also known as Porto Lago the area was occupied by the Italians as they had there naval base located here. There is a quay to moor on to but beware on the South section of the quay there is a steel rod. It is not recommended to tie in Lakki when there are Southwest and west winds as it becomes dangerous. Water and fuel are available as well as provisioning. There are a number of tavernas for eating out. Ormos Partheni – This bay is located on the North side of Leros. It offers good shelter from the weather. You must anchor on the East side as the S and SW are military areas and anchoring is prohibited as well as photographs. Ormos Plakouti – Located on NE coast of Leros it offers good shelter except from Northeast and easterly winds. Be careful of the visible rocks in the middle of the bay. 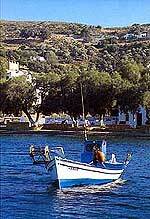 Xerocambo - A large bay located on the south side of Leros which offers good protection from the meltemi. 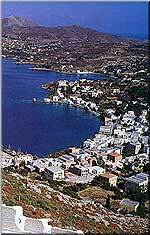 Ormos Alindas- This large bay is located on the east coast of Leros. There is a Venetian castle on the hill top above. When there is the meltemi the bay can get fairly rough. There is a small mole but due to the bottom is rock it makes for bad holding. Fuel and water are available and most provisioning can be found near by. Panali - This bay offers good protection from the meltemi. You can anchor off the beach in 4-8 meters depth. This is a nice bay for a swim.